Hard on the heels of the news that HP's webOS Global Business Unit is being spun off as an independent but wholly owned company called Gram, the company on Friday officially launched Open webOS into beta. Fifty-four webOS components are now available in open source form, specifically, bringing forth more than 450,000 lines of code released under the Apache 2.0 license. Meanwhile, the webOS team is continuing its hiring drive, the post announces; a jobs page lists open positions. To recap, HP announced last August that it planned to discontinue its webOS tablets and phones. Soon afterwards, it made the decision to open-source the technology, enabling developers and manufacturers to use the Linux-based operating system for their own purposes. I've been excited by webOS's strategy and potential under this new scheme, and work has progressed steadily ever since, including the release of Enyo 2.0 back in January and, subsequently, the Isis browser. The launch of Gram could also signal promising new life for the effort. Now, in this latest move, yesterday's release provides not just one but two build environments for developers. 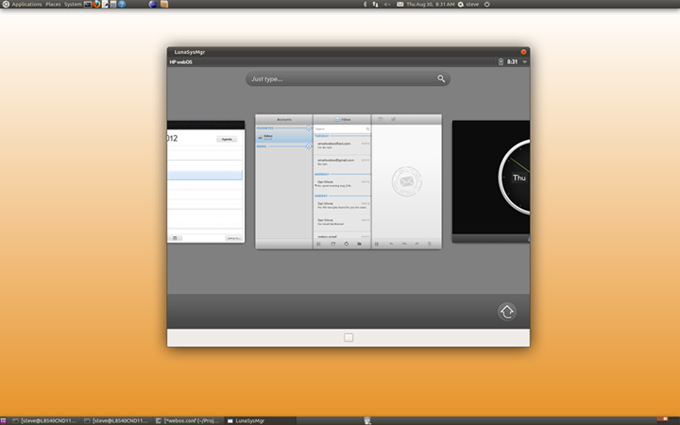 That build incorporates much of what has been released so far on the Ubuntu desktop. Many third-party Enyo apps are supported as well. HP promises an announcement regarding its future plans for Open webOS when it makes another release next month. I'll keep you posted if I hear anything else in the meantime.